Mountainside on Attitash is ideally located on 37 wooded acres which slope gently upwards from Route 302 to the White Mountain National Forest, right between Attitash and Bear Peak Ski Areas. On the east is Attitash Mountain's Far-Out Trail, and on the west, Stony Brook, the cascading stream that gives the adjacent trail its name. Each townhouse has been individually adapted to its natural and naturalized setting, enhancing both the individuality of the home and the beauty of the area. 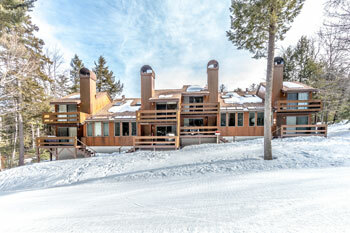 All homes have direct access to a ski trail, while nearly half overlook beautiful Stone Brook. LOW ENTRY design offers 3 bedrooms and 2 baths. Most have the garage conversion to a Family Room and Bath. Entry is through the foyer, up a few steps to the living room. HIGH ENTRY design offers 3 bedrooms, 2.5 baths plus bi-level loft bedroom. Entry is through an airlock vestibule into a foyer which overlooks the living room a few steps below. There are only 6 of these 60 townhouses with a fireplace in the Master Bedroom as well as the Living Room, and 4 units with garages. The design of each Mountainside on Attitash trailside townhouse incorporates exceptional spatial planning which ensures the privacy of all family members and guests. Elements such as skylights, oak and pine trim, European-style cabinetry, and Italian tile unify the design, but each light and airy room maintains its own character. 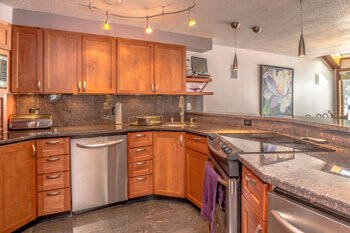 This is a home designed for enjoyment, entertaining and total convenience. For more information on Mountainside on Attitash, contact Joy Tarbell, the Realtor who lived and raised her family on Attitash for 25 years, and has all the insider info you need to make a good decision.